Simeon Ferris and his wife, Hila Ann (June) Ferris had a good life in Mehoopany, Pennsyvania, in the 1850’s. They had 12 children, eight sons. Little did they know that by 1865 they would have suffered the worst loss a parent may have, the death of a child, not once but three times. Union soldier. Enlisted Oct. 11, 1861. Died in Washington, D.C. Dec. 25, 1861. Possibly died of an illness. Union soldier. Killed in action at the battle of Fair Oaks, Henrico County, Virginia on May 31, 1862. Union Soldier. 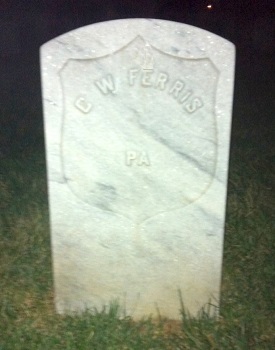 Served with the 52nd Pennsylvania Infantry. Died in camp hospital, Alexandria, Va. before reaching his unit. Buried in Arlington Cemetery, Section 13 Grave 6894.